There’s an interesting movie tucked away in Hyde Park on Hudson, but it’s not a biopic of Franklin D. Roosevelt. No, on that front, director Roger Michell (Venus; Notting Hill) and writer Richard Nelson fashion a tedious, tawdry tabloid. Reducing the president who led America through the Great Depression and World War II to an impish lothario trawling the Hudson Valley for impressionable kin and starstruck confidants, Hyde Park on Hudson feels as if it should be accompanied by the tag "Showtime Original Picture." 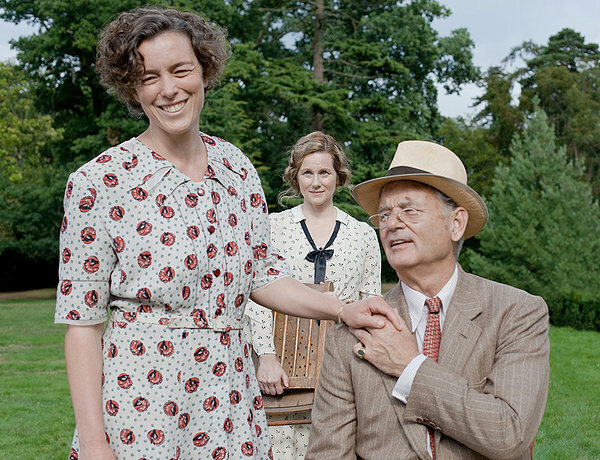 Margaret “Daisy” Stuckley (Laura Linney) is seemingly plucked from pastoral obscurity by FDR (Bill Murray), her sixth cousin, and invited to visit his country estate at Hyde Park, New York. The two soon go from admiring Roosevelt’s stamp collection to joyrides punctuated by happy endings in his convertible Plymouth. 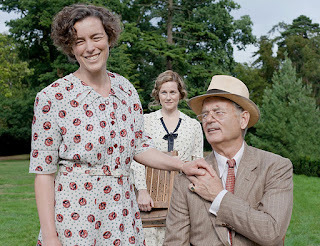 Against this backdrop of handjobs on Hudson, Daisy develops uneasy relationships with FDR’s private secretary Missy LeHand (Elizabeth Marvel) and his wife Eleanor (Olivia Williams), depicted here as a little more than a leftist virago and closeted lesbian. Roosevelt’s affairs and strained marriage are well-documented. But here they are foisted for little more than titillation, lacking any context or examination. Even Murray’s charming portrayal—more approximation than impersonation—lacks any sense of such rank self-indulgence. The one allowance for historical context comes with the celebrated visit to Hyde Park by King George VI, aka “Bertie” (Samuel West) and Queen Elizabeth (Olivia Coleman) in June 1939, the first time a reigning British monarch set foot on U.S. soil. Serving as a veritable sequel to The King’s Speech, this intriguing subplot follows the Windsors as they come hat in hand to solicit America’s assistance against the surging Nazi tide. The seeming indignities of modest accommodations, breaches of protocol, and an outdoor picnic with hot dogs and Native American entertainment are the consequence of FDR’s political genius. Plagued with self-doubt, the 43-year-old Bertie finds solace as Roosevelt’s juxtaposes his polio affliction with the king’s chronic stutter. The president assumes the role of father-figure to a monarch who never felt his father’s approval. These scenes, swirling with the undercurrent of Britain and America’s tumultuous history, are the unquestioned highpoint of Hyde Park on Hudson. The rest of this meager tale is a dime-store Downton Abbey.